Tiger Termite and Pest Control was founded in 1997 on the basic principles of providing quality service, treating people fairly and doing the job right without cutting corners. We take pride in protecting people, property, and pets from unwanted pests and stand behind every job we complete. If you are looking for a Local Chino Hills Pest Control Company choose Tiger Termite you’ll be happy you did. 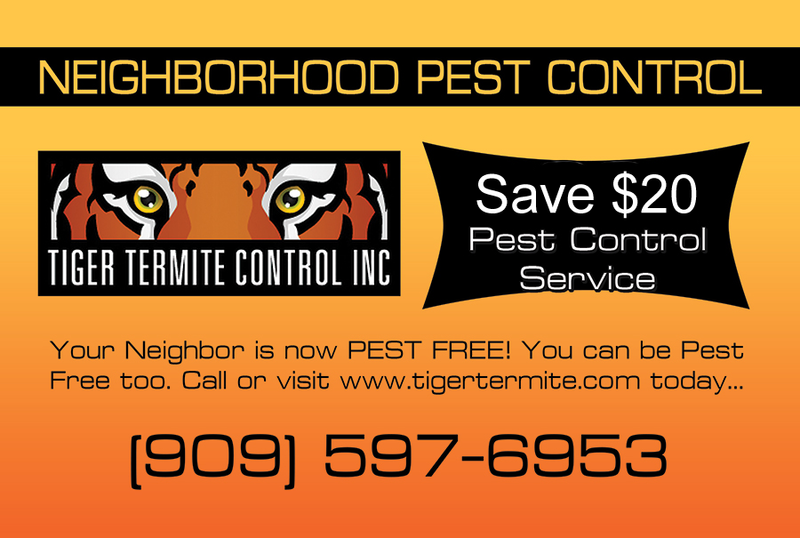 Welcome to Tiger Termite and Pest Control, the premier source for pest control and termite services in Chino Hills! There is a reason that the word “pest” has a very negative connotation- no one wants to deal with disgusting bugs in their home. Unfortunately, pests come in all shapes and forms, but when you hire Tiger Termite and Pest Control, you can count on a company that has unmatched skills and expertise in removing pests, and preventing them from coming back. At Tiger Termite and Pest Control, we take pest control very seriously. Our company has been providing unsurpassed pest control service in Chino Hills for many years, and we pride ourselves on staying ahead of the curve when it comes to the most effective methods for eliminating pests. Whether you are dealing with insect, termite, or rodent problems, Tiger Termite Control can take care of all of your pest problems! We specialize in using state of the art pest removal methods, while also ensuring that our pest control services are completely safe for the children and pets in your family. The main goal of Tiger Termite and Pest Control is to combine the best pest control treatments available with exceptional customer service. We truly appreciate your patronage, and we make it a point to provide services that will not only leave your home pest-free but will also ensure that you are completely satisfied with our company. Our pest control services are backed by a 100% satisfaction guarantee. As a local company, we strive to provide our loyal customers with the very best pest control services in Chino Hills. Unlike huge, national pest control companies, Tiger Termite and Pest Control is invested in our community, and we offer our services at prices that cannot be beaten. “We use Tiger Termite and Pest Control on a regular basis to keep our home pest-free. We haven’t seen any bugs, and we appreciate the professional, courteous service that they provide”. “There are a number of pest control services in Chino Hills, but we always give our business to Tiger Termite and Pest Control because we have had great experiences with their customer service”. We invite you to contact us today if you are dealing with pest problems, or if you would like to start a treatment service to keep your home pest-free. We are currently offering a $20 discount. Whether you need a one-time service or would like the convenience of regularly scheduled visits, you can count on us to design a personalized program for your individual needs. When you have a property with a termite or pest problem, you want to get the problem fixed right the first time. For quality termite or pest control and fast results, call us today at (909) 597-6953 and get a free estimate!